1. 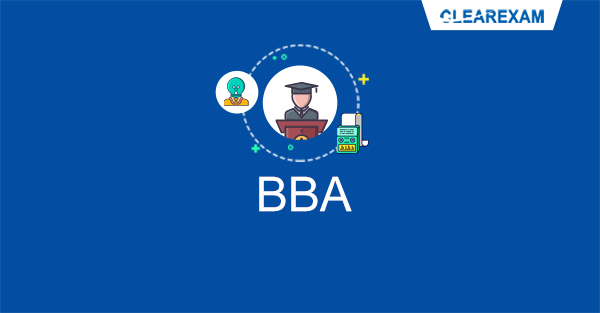 What is the exam syllabus for BBA entrance exam? English: The section will cover questions testing the candidates' English proficiency through comprehension passages and grammar related questions. The comprehension passages checks the students ability to understand it and the theme involved. It also tests the candidates' vocabulary. The section on grammar has questions testing the candidates ability to form sentences coherently, filling the blanks, prepositions etc. General Awareness: One of the widest sections in the test, the GK questions revolve around general awareness comprising of static GK and current events of the past year (usually). It includes national and international events. Quantitative Aptitude: This section will cover only the elementary maths, i.e. maths taught up to Class X. Concepts involved will be basic in nature however the candidate has to practice enough to solve the practical questions. Logical Reasoning: This section purports to test the candidates' ability to identify patterns, logical arguments and links and correcting illogical sequences. It has a vast array of questions including logical sequences, syllogism, analogies etc. No visual reasoning will be tested in this section. 2. What importance do mock tests hold in BBA entrance exam? Once you feel you have covered everything, make sure that you take ample BBA mock tests and complete practice question papers on a regular and timely basis. You should solve these BBA mock test diligently since they will again help in identifying your weak areas as knowing the concepts and applying them in practical problems while being under the time pressure is quite different. Keep a track of your progress and performance in the BBA mock tests and analyse it to see how your ability to ace the exam is improving. These BBA mock tests again will help you identify your strengths and weaknesses which can be worked upon accordingly. 3. What reading and study material is required for BBA entrance exam? The following books form an important part of your BBA Study Material and BBA mock test needed to crack the exam successfully. Of course, this is not an exhaustive list whereas it is a list of a few books which must be covered by the candidate to get a strong hold on their basics. 4. Are coaching centres helpful for BBA entrance exam? BBA coaching centres offer many advantages. These coaching centres often small batch sizes which enables the teachers to pay closer attention to the individual students. They can help the students on a more personal level rather than simple classroom discussions. They provide good BBA study material which is vetted and checked to ensure that it covers the whole syllabus. The teachers are themselves experiences and highly qualified who help the candidate navigate through the voluminous course with relative ease. They provide regular BBA mock test which help the candidates perfect their scores over a period of time. Many of the BBA coaching centres in Delhi have good infrastructure which facilitate a more interactive type of learning style. The classrooms are equipped with branded projectors and computer systems that can make grasping of concepts easier. They are usually very accessible in terms of their location so that the students can reach the centres quick and in a way which is the most cost-effective for them as well. 5. Is self study better than coaching for BBA preparation? Self study simply refers to making a study plan on your own and compiling the BBA study material by yourself. It is not necessary that without the help of a coaching instructor or guide you will be lost. A good way to start is to develop a structured study plan paced out over a calendar from the date you start till your tentative exam date. This will act as a self guide for you to keep track of your progress. Many students have noted that classroom coaching for them is ineffective and exclusionary since it does not focus on them individually. The classroom moves at the average pace of the students and whoever falls behind has to catch up on their own. All students have individual styles of learning which the classroom coaching does not cater to hence making the same monotonous and boring. The classroom coaching is not flexible at all as the students are required to meet at strict times failing which they may miss out on the important topics being taught that day. However, self study comes as an incorporating alternative which is nothing but flexible in nature and can accommodate the students varying schedule. It provides for leeway and a comfortable pace at which the student can practice more effectively. Time management through self study becomes simpler because the need to accommodate other students time is absent here. Many times in the classroom, information is simply bombarded onto the students without catering to the curiosity aspect of the students. No opportunity to ponder over this information is provided since the coaching institutes have a strict deadline with respect to the amount of course material they need to finish within a given time frame. Several people find that engaging such institutes is often not worth it as they feel they are self sufficient and motivated enough to manage the studies for the exam on their own since the coaching institutes often charge a hefty fee. BBA entrance exams are highly rated aptitude tests which require constant hard work and perseverance. With constant dedication and discipline, the candidate can easily crack this exam. Good quality vetted BBA Study Material and regular BBA mock test can help the candidate ace the exam and score well.